When I created the “WallyWorld” CD I envisioned a sonic rhythmic trip around the world. If you put on your headphones, press play and listen, you will travel to different countries and hear the jams of amazing musicians playing grooves and flavors of diverse cultures creating a varied musical menu. 1. Funky Arequita – This composition takes you to Venezuela. The main groove comes from a ¾ rhythm I used to listen as a child by Aldemaro Romero, creator of the “New Wave” ( onda nueva) genre derived from Joropo and Bossa Nova. Blending this with R&B jazz flavored grooves and an audio mix inspired by Tony Allen’s Afrobeat style, gives you “Funky Arequita”. 2. Abakuando – Derived from an afro Cuban Abakua rhythm played on the drum set. It evolves into rock blues guitar melodies. The mixture of Afro Cuban polyrhythms, rock grooves and wailing guitar riffs makes this a unique soundtrack-like musical piece. 3. Maracatu - This piece takes you to Northeast Brazil, to the state of Pernambuco where the Maracatu rhythm is from. I was there in the 90’s and absorbed these “turned around” polyrhythm grooves watching Maracatu ensembles of hundreds playing together. 4. Zouk du Jour - “Zouk” is a rhythm from Martinique/Guadaloupe French Carribean Islands. It is a happy, festive dance party groove. Richie Garcia plays “quinto” on the left speaker and I am playing timbales and bongos on the right speaker creating a rhythmic conversation. 5. 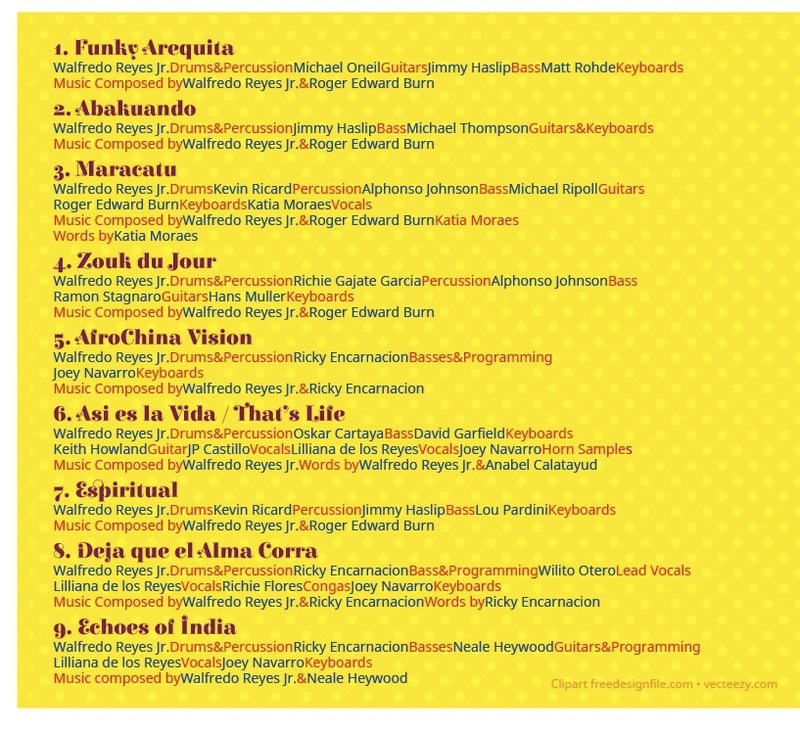 AfroChina Vision- It’s a journey that starts in Asia and by the use of the bass melody, bridges Asian and African grooves. It’s a soundtrack to the film in your head! 6. Asi es la Vida/That’s Life - This tune, in it’s entirety, came to me walking in the streets of Paris on my way to a Cuban concert while speaking English to my French friend. It’s a “cha cha cha” rhythm mixed with a drum set 2 & 4 beat and blues guitar riffs. It’s a great party dance tune. 7. Espiritual - Is a Jazzy/Samba Rio-style tune played on the drum set, percussion, piano and bass. The B section goes into a “Partido Alto” samba-style groove and it fades with a 15/8 samba. The piece features outstanding piano melodies and improvisations. 8. Deja que el Alam Corra – This is a Puerto Rican-Cuban Timba, NY funky mix. It’s a fusion of Latin-Funk flavors with amazing vocals, slap bass and piano “montunos”. Bring on the hot sauce!! 9. Echoes of India - I end the CD with a soothing, sensual taste after all the spicy dance rhythms. This is a trance guitar rhythm that inspires meditation and mind travel. This hypnotic repetitive groove puts you in a mellow mood. The images of “India” came to mind when I first heard the beautiful guitar riff. I hope that you will enjoy this musical journey, as well as the images that this collection of rhythms and flavors will trigger in your mind and spirit. If you are interested in a further breakdown of the rhythms featured in the this CD, I would recommend my instructional DVD “Global Beats” for drum set and percussion by Hal Leonard Publishing as this DVD explains many of “WallyWorld” CD ‘s grooves in detail.